One of the stranger ironies of global trade rules is that countries no longer enjoy the sovereign right to pass laws even if these are intended to protect their citizens’ lives and well-being. Bilateral treaties and the World Trade Organization (WTO) agreements stipulate what member states can or cannot do. Nowhere is this paradox more evident than in the campaign against smoking. Big Tobacco has used every forum it can garner to stop countries from passing or implementing tobacco control measures, particularly plain package laws. Plain packaging removes all branding including images, colours, corporate logos and trademarks, allowing manufacturers to print just the brand name in a specified size on the cigarette pack. All tobacco packaging is required to be standardised with the dominant message being health warnings. In 2010, Uruguay became the first target of Big Tobacco when its strict rules to control tobacco use were contested by Philip Morris which claimed that the Uruguayan Public Health Ministry had infringed its intellectual property rights (IPRs) and thus violated its commitments under one of its bilateral investment treaties (BITs). Similarly, Australia, too, was dragged to international arbitration by Philip Morris under another BIT after the country passed its plain packaging law in 2012. Canberra’s argument that its measures were intended to protect public health did not cut ice with the tobacco industry. As per government estimates smoking kills 15,000 Australians each year and costs the country about US $22 billion in social and economic terms. Although both Uruguay and Australia were successful in defending their laws in the BIT cases, Big Tobacco had another ace up its sleeve. It got some nations to file a complaint against Australia at the WTO that its tobacco control measures were in violation of the WTO’s agreement on Trade-Related Aspects of Intellectual Property Rights or TRIPs. At WTO, only member states can file cases against another. The complaints against Australia were filed by Honduras, the Dominican Republic, Cuba and Indonesia. After six years, in which 34 other countries and the European Union made themselves party to the dispute, the smoke has cleared over the tobacco control measures with a dispute settlement panel at WTO ruling on June 28 that Australia’s plain packaging law does not violate its obligations under TRIPs. The panel found that the complainants had not been able to show that Australia’s measures are inconsistent with its obligations under the provisions they had cited. These are provisions of the WTO’s Agreement on Technical Barriers to Trade apart from those of TRIPs. This is no mean victory in a dispute that pits public health concerns against commercial interests and WTO’s trade commitments against the Framework Convention on Tobacco Control (FCTC) of the World Health Organization (WHO) which urges nations to adopt plain packaging. What probably helped was the joint submission made by WHO and its FCTC secretariat acting as amicus curiae. 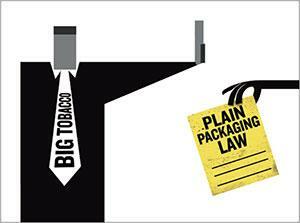 Plain packaging is one of the recommendations of FCTC. Analysts believe that WTO decision effectively removes the biggest hurdle to passing stricter tobacco packaging laws and is certain to hasten implementation of plain packaging globally.